O.S. Nock. 1970. The year in retrospect. Locomotive Causerie No. 174. 2-5. Description with photographs of mechanised hump marshalling yard. Brief biography W.D. Lander, Yard Master. P.W. Gentry. A railway by-way in Dorset. 10-12. H.M. Madgwick. Portsmouth Harbour in retrospect. 13. Portsmouth Harbour station opened in 1873: jointly owned LBSCR and LSWR. Several photographs of No. 30585 in service; also view of LSWR No. 329 in 1922. W.A. Camwell and C.R. Clinker. Around the branch lines. 18-19. R.S. McNaught. The last Webb 2-4-2 tanks. 19-21.. Became acquainted with class as a boy in Shrewsbury in about 1904. Two of them worked a Royal Train conveying King Edward VII from Swansea to Rhayader on the Central Wales line. Illustrations: No. 32 at Manchester London Road and No. 6603 at Crewe in 1939. Snowdon Mountain Tramroad Abt system locomtive Wyddfa built by the Swiss Locomotive & Machine Works. J.R. Hollick. High Carr Point signal. 24. W.A. Camwell. Some shed scenes to remember. 24. O.S. Nock. 1970. Locomotive Causerie No. 176. 49-52. Looking to future with diesel and electric traction and average speeds of 100 mile/h. G.H. Robin. With the Caledonian Railway from Hamilton: some railway by-ways in South-West Lanarkshire. Part 2. 53-? John A.N. Emslie. Fish traffic in Scotland's North East. 61-3. From Fraserburgh and Peterhead in refrigerated containers to London and Manchester. W.A. Camwell and C.R. Clinker. Around the branch lines. 63-4. N1 No. 69478 at Cullingworth on 17.48 Keighley to Bradford Exchange on 15 May 1954 and No. 62440 Wandering Willie at Kelso on 14.21 to St. Boswells on 14 October 1954. Kettering on 7 August 1954 with Nos. 78028, 65390 (J15) and 40022. O.S. Nock. Developments and trials. Locomotive Causerie No. 178. 97-100. J.B. White. The West Cumberland diesel railcar scheme. 101-5. G.T. Moody. The West London Lines. 106-11. W.A. Camwell and C.R. Clinker. Around the branch lines. 111-12. J.W. Grant. Locomotive lineaments. 114-19. Illustrations include crab Horwich 2-6-0 No. 2794; L&YR 0-6-0s Nos 12107 and 12465 at Bletchley; Q1 No. C17 at Eastleigh as well as No. 5034 Corfe Castle and A3 No. 60039 Sandwich plus coments on cabs, domes, chimneys. Last 'Scot' gets the taper boiler. 119. W.A. Camwell. Some shed scenes to remember. 120. O.S. Nock. The "Cornish Riviera" trials. 145-50. See also letter from W.A. Tuplin p. 258. J.B. White. The Harwich-Zeebrugge train ferries. 150-5. Notes on MV Norfolk Ferry, Suffolk Ferry and SS Essex Ferry and pictures of wagons being loaded at Harwich and of the Zeebrugge ferry terminal. Also Interfrigo van. The "Franco-Crosti" Class '9'. 155-7. Ten locomotives Nos. 92020-92029 being built with Franco-Crosti boilers in collaboration with Piero Crosti; designed at Brighton under Riddles/Bond. Official illustrations. No. 92031 at Hitchin wwhen it had hauled 16.50 ex-Hull and Harrogate from Bigglewade when it had displaced failed A1: it was replaced at Hitchin by a B1 for run onto King's Cross. R.E. Vincent. The good old days. 158. Extracts from the press of 1845. W.J. Reynolds. A notable withdrawal... 159. Drummond L12 4-4-0 No. 30434: illustration shows SR No. S434 with rimmed chimnay. O.S. Nock. The Mid-day Scot. Locomotive Causerie No. 181. 169-74. J.B. White. Railway electrification in Belgium. 174-80. 3000 V dc electrification using a mixture of locomotiv hauled trains and multiple units. Routes electrified included Ostend to Brussels and thence to Louvain and Antwerp and south to Charleroi. Extensions in progress included line to Luxembourg and to Liege. Illustrations include catenary, signalling and locomotives. Maps show network..
McNaught, R.S. The Dean Goods class 1883-1955. 181-3. Tenbury Wells with No. 1455 on 16.46 auto train to Woofferton on 14 August 1954 and GWR railcar No. 19 at Arley (Severn Valley Railway) on Good Friday 16 April 1954. U.S.-built coach on London Midland Region. 186. Budd Car Co. stainless steel open saloon M 7585 ran as a first class vehicle initially between Euston and Heysham. 4-wheel diesels for Watford line. 186. T.G. Hiscock. The South Devon Railway. 187-90. Conversion of 70 control trailers into ordinary trailers using seating from scrapped cars. Illustration supplied London Transport. Includes illustartion of No. 338 running trials near Littlehampton in 1913. No. 5016 Montgomery Castle on South Wales Pullman at Ely, west of Cardiff on 27 June 1955. W. Jones. South Wales revisited. 197-202. W.A. Tuplin. Incident at Holme. 203-4. Travel on down Yorkshire Pullman interupted by failure of A3 at Holme due to connecting rod. Replaced by a V2 and passengers made collection for driver. R.E. Vincent. The Snowdon Mountain Railway. 204-7. Part history, part a description of the journey, and part a response (with photographs) of a specific journey..
Franco-Crosti 2-10-0s  some comments. 207. Photographs taken by Philip J. Kelley at Elstree on 16 July 1955 of No. 92026 with Franco-Crosti boiler and No. 92018 without. Drivers and firemen at Cricklewood found the exhaust fumes blackened the cab, , and criticised the poor draughting and difficulty in burning large coal. W.A. Camwell and C.R. Clinker. Around the branch lines. 208-9. No. 62276 Andrew Bain on 10.18 Carigellachie Junction to Boat of Garten between Cromdale and Grantown on Spey on 21 May 1954 and J37 No. 64557 at Gullane on freight on 15 October 1954. G.T. Moody. Midland to the City. 210-14. Spalding on 4 October 1953 with J52 No. 68846, Class 4 2-6-0 Nos. 43060 and 43085 and J6 Nos. 64279, 64231 and 64224. Dundalk on 17 April 1954 with 0-6-0s: SG3 No. 49, UG No. 147 and PG No. 11. H.M. Madgwick. The last of the 'Atlantics'. 216. Comment on the surviving H2 Braighton Atlantics and illustration of frames and wheels and motion of H1 type? Western Region 0-6-0PT No. 2757 and London Transport crane. C.R.L. Coles. On extension to West Ruislip prior to completion of Central Line. O.S. Nock. Holidays in North Wales. Locomotive Causerie No. 184. 241-6. W. Jones. 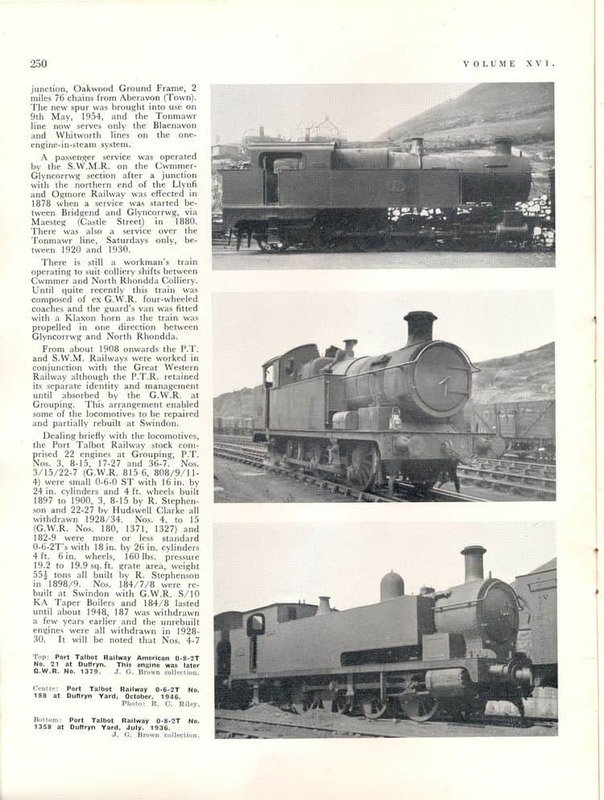 The Port Talbot and South Wales Mineral Railways. 246-51. Map and gradient profile shows character of the railways. W.J. Hosgood was the Locomotive Superintendent of the Port Talbot Railway: his brother, John Howell, held a similar position on the Barry Railway. Illustrations: 2-4-2T No. 36 (GWR No. 1326); Rebuilt Rhymney Railway 0-6-2T No. 69 at Duffryn Yard in July 1936; rebuilt Cooke 0-8-2T No. 21 at Duffryn; 0-6-2T No. 188 at Duffryn Yard and 0-8-2T No. 1358 at Duffryn Yard in July 1936: see image below. W.A. Tuplin. Farewell to steam: riding the footplate of a Pennsylvania 4-4-4-4. 252-4. Englewood to Fort Wayne in 1949 on T1 locomotive hauling 1000 ton passenger train at an average speed of 70 mile/h. Sign at Salton on Southern Pacific RR. H.M. Madgwick. The 'E2' class shunting tanks of the L.B. & S.C.R. 255. Illustration of No. 109 with trilby-hatted friend resting against locomotive. J.I.C. Boyd. Glimpses of the narrow gauge. 257-8. Robert Stephenson & Co. 4-4-0T locomotives for Cavan & Roscommon Light Railway & Tramway Co. Ltd. No. 3 Lady Edith (illustrated) was intended for main line use and No. 5 Gertrude for tramway use: was intended to operate in reverse and had fully enclosed motion and wheels. I was surprised and sorry to ·see my friend Mr. Nock coming rather near (on p. 220) to the "red herring" technique. usually found only as an alternative to the impotent controversialist's standard refuge of misquotation. There are certainly many doubts about tractive resistance of trains but the main point inl my letter on p, 185 (Aug. 1955) was that so far as can now be estimated, the power required to haul 420 tons between Exeter and Paddington in 157 minutes was not so great as that required to take 575 tons between the same points in 176 minutes as was done in 1933. This is true, whatever resistance formula one uses. If one is disinclined to believe that the big effort of 1955 could have been surpassed in 1933, one may suggest that the earlier run was made with the help of an overtaking hurricane, or that the rolling resistance was low because of specially slippery moisture on the rails or that it was a cold day with light air and all windows shut, but if surmises at this sort are accepted then it is purposeless to quote figures at all. One simply says "I think this is the best run ever made and as train resistance is never precisely known, my opinion cannot be controverted by any figures." M:r. Nock's reference to "petty contraveraialism" is a passing phase. One is always depressed to find that a bright idea or a subject for new enthusiasm is actuually quite old. One feels momentarily aggrieved with whoever points it out. But one's sobs soon cease and the censorious mood passes. The truth is sure to be brought out by someone however many may miss it, and the sooner the better. One recollects that where one person writes on a point of current interest, a hundred others have seen it but have not written. One resolves either to temper enthusiasm with caution or not to express it in figures. Published figures about locomotive performance create the perennial risk that someone may discover them to have meanings that disagree with the verbally expressed assessment of the performance and then suspicion is aroused. Truth-seekers murmur darkly. They ask innocent questions. Carpers carp. The evil of the printed figure lives far too long for comfort whereas words are thrice blessed. They tie down neither him who gives nor him who receives and they can be made to express vividly what figures can but coldly set forth even when they mean anything at all. But to put the same thing in both words and figures may invite dissent. Dean Goods. L.W. Bromley. 259. States that locomotive at Longmoor was built for "Taff Vale Railway"
W.A. Camwell and C.R. Clinker. Around the branch lines. 260-1. Leven with No. 62467 Glenfinnan on 07.18 Dunfermline Upper to St. Andrews on 13 July 1955 and Cardenden with No. 61349 on 07.40 Glasgow Queen Street to Thornton Junction on 14 July 1955. Notes on Leven Railway incorporated 17 June 1852 and officially opened on 5 August 1854, although open for passenger traffic from 3 July 1854; the East of Fife Railway of 23 July 1855 which opened to Kilconquhar on 11 August 1857.